Those Daredevil fans who are also familiar with the early issues, will know that there was a time when Daredevil’s billy club wasn’t just a cane turned bludgeoning tool. Alongside whatever you need to shove in there to get it to fire a wire attached to a grappling hook, it would feature smoke screen pellets, a plastic sheet, and a snoopscope. And that doesn’t even begin to cover it. 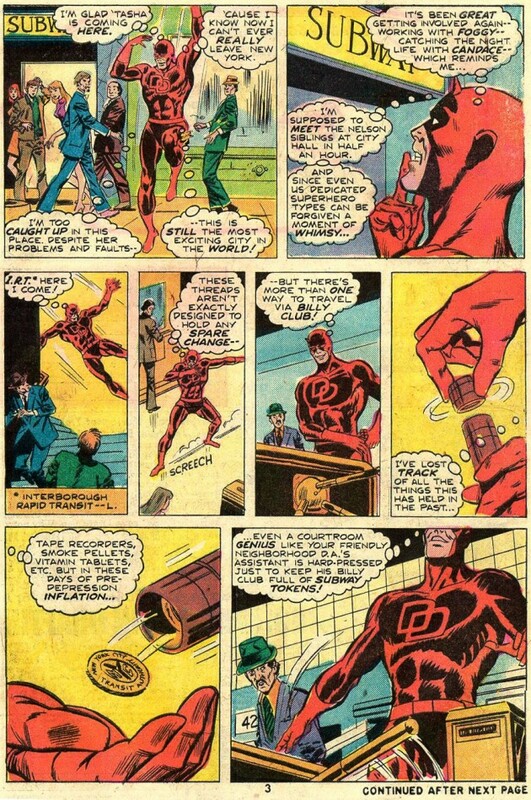 Daredevil reminisces about the old days in this very funny page from Daredevil #119, by Tony Isabella and Bob Brown, where we learn that he hasn’t completely given up on finding new purposes for it. Here, it’s used to hold subway tokens! I love Daredevil’s billyclub so much. Subway tokens, pills, and a recorder, could all fit in a cane (or come close). Now, the ability jam 30-45 feet of aircraft control cable, and the mechanisms to shoot a grapple into something that’s basically a chair leg, that is a real trick.